1. For symptomatic improvement and healing of gastrointestinal diseases which require a reduction in acid secretion:- i) duodenal ulcer, ii) gastric ulcer, iii) gastro-oesophageal reflux disease (GORD): Symptomatic GORD. The treatment of heartburn and other symptoms associated with GORD; Reflux oesophagitis iv) gastrointestinal lesions refractory H2 blockers v) Zollinger-Ellison Syndrome. Patients whose gastric or duodenal ulceration is not associated with ingestion of non-steroidal anti-inflammatory drugs (NSAIDs) require treatment with antimicrobial agents in addition to antisecretory drugs whether on first presentation or on recurrence. 2. Maintenance of healed reflux oesophagitis in patients previously treated for moderate to severe reflux oesophagitis. 3. For eradication of Helicobacter pylori, treatment with pantoprazole and one of the following combinations of antibiotics; i) Clarithromycin and amoxicillin, or ii) Clarithromycin and metronidazole, or iii) Amoxicillin and metronidazole is recommended in cases of duodenal ulcer and gastric ulcer with the objective of reducing the recurrence of duodenal and gastric ulcers caused by this microorganism (see Dosage & Administration). 4. Pantoprazole in combination with bismuth, metronidazole and tetracycline is indicated for the eradication of Helicobacter pylori associated with peptic ulcer disease with the objective of reducing the recurrence of peptic ulcers caused by this organism. 5. Prevention of gastroduodenal lesions and dyspeptic symptoms associated with non-selective non-steroidal anti-inflammatory drugs (NSAIDs) in increased risk patients with a need for continuous non-selective NSAID treatment. Adults: 1. Symptomatic improvement and healing of gastrointestinal diseases which require a reduction in acid secretion: i) Duodenal ulcer; ii) Gastric ulcer, iii) Gastro-oesophageal reflux disease (GORD): - Symptomatic GORD. The treatment of heartburn and other symptoms associated with GORD; - Reflux oesophagitis; iv) Gastrointestinal lesions refractory to H2 blockers; v) Zollinger-Ellison Syndrome. Patients whose gastric or duodenal ulceration is not associated with ingestion of non-steroidal anti-inflammatory drugs (NSAIDs) require treatment with antimicrobial agents in addition to antisecretory drugs whether on first presentation or on recurrence. 2. Maintenance of healed reflux oesophagitis in patients previously treated for moderate to severe reflux oesophagitis. 3. For eradication of Helicobacter pylori, treatment with pantoprazole and one of the following combinations of antibiotics: - Clarithromycin and amoxicillin or - Clarithromycin and metronidazole, or - Amoxicillin and metronidazole is recommended in cases of duodenal ulcer and gastric ulcer with the objective of reducing the recurrence of duodenal and gastric ulcers caused by this microorganism (see Dosage & Administration). 4. Pantoprazole in combination with bismuth, metronidazole and tetracycline is indicated for the eradication of Helicobacter pylori associated with peptic ulcer disease with the objective of reducing the recurrence of peptic ulcers caused by this organism. 5. Prevention of gastroduodenal lesions and dyspeptic symptoms associated with non-selective non-steroidal anti-inflammatory drugs (NSAIDs) in increased risk patients with a need for continuous non-selective NSAID treatment. Children aged from 5 to 17 years: Gastro-oesophageal reflux disease (GORD) - Symptomatic GORD. The treatment of heartburn and other symptoms associated with GORD. - Reflux oesophagitis. The treatment duration should not exceed 8 weeks. Short-term use where oral therapy is not appropriate for: 1. Symptomatic improvement and healing of gastrointestinal diseases which require a reduction in acid secretion: Duodenal ulcer, Gastric ulcer, Reflux oesophagitis, Gastrointestinal lesions refractory to H2 blockers, Zollinger-Ellison Syndrome. 2. Maintenance of healed reflux oesophagitis in patients previously treated for moderate to severe reflux oesophagitis. Note: Patients whose gastric or duodenal ulceration is not associated with ingestion of non-steroidal anti-inflammatory drugs require treatment with anti-microbial agents in addition to anti-secretory drugs, whether on first presentation or recurrence. White to almost white dry substance. 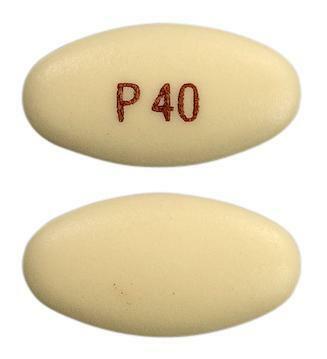 Yellow, oval, biconvex enteric-coated tablet with white to off-white cores.The tab are marked with letter "P40" one side and blank on the reverse. Tab dimensions height 4mm length 12mm width 6mm. Yellow, oval, biconvex enteric-coated tablets with white to off-white cores. 'P20' printed on one side in brown ink. Helicobacter pylori can irritate the gastrointestinal system, and cause ulcers and other problems in the stomach and in the duodenum. A specific treatment has been developed for the eradication of H. pylori. Proton pump inhibitors (PPIs) are a commonly prescribed class of medications whose main action is to create a pronounced and long-lasting reduction of stomach acid production. They are used for the treatment of a number of medical conditions, most often for gastro-oesophageal reflux disease (GORD). Constipation in children is quite common and can contribute to the severity of reflux. Discusses constipation, motility disorders and GORD in children.